In 2016, no one in the Belgian population was exposed to annual mean concentrations above the European treshold of 40µg/m³. 19% of ht epopulation was however still exposed to annual mean PM10 concentrations above the treshold of 20µg/m³ advised by the WHO. The downward trend in population exposure of recent years continues. 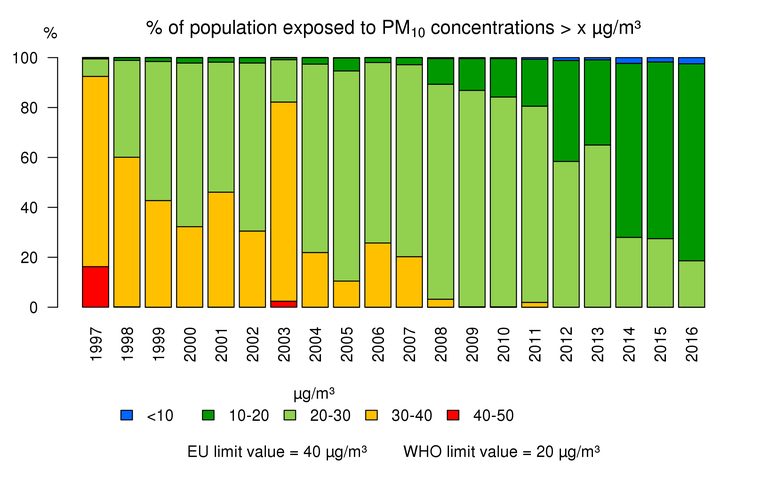 In 2016, 81% of the population was exposed to PM10 concentrations below the WHO guideline value (< 20 µg/m³), whereas in 2011 this percentage was only 19% and in 2006 even only 2%. Evolution of the population exposure to annual mean PM10 concentrations based on the RIO interpolation technique.